If you are searching for a dependable and experienced fence contractor in the Tampa Bay area and throughout Florida, look no further than the professionals at West Florida Fence. In business since 1996, West Florida Fence’s team consists of skilled and organized project manager’s, estimators, and safety-trained installers that understand the demands of new construction site, Government, Military, and secure facility environments. We have the training, experience, and know-how required for dependable commercial and security fence contracting no matter the project requirements. Professional installation and service is what we pride ourselves on. Along with great service, we offer a variety of options for you to choose from and will work with you to design the best plan for your security and commercial fencing needs. 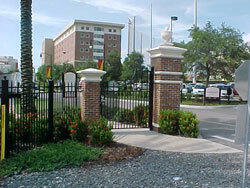 West Florida Fence’s capabilities include; wrought iron, chain link and aluminum fencing. Many high quality security fence options exist and we will work with you to choose the best one for your site specific needs. The key is finding the right combination of fence style, fence height, features, and accessories to come up with the right blend of aesthetics, security, and strength. Qualifications: State-Certified Building Contractor, Bondable, Fully Insured, and can provide references. Clients/Experience: General Contractors, Amusement Parks, Government, Military, Airports, Athletic Facilities, and more…. Our commercial fence installers have over 150 years of combined working experience, so you can rest assured that the job will get done right the first time when you choose our company for your fence project. Without the proper security precautions at your commercial building, you have a lot of ongoing risks when the building is occupied and when it is not, so contact West Florida Fence today and we’ll start right away. Many of our commercial fence products offer a 20 year warranty. Our dependable installers allow us to offer a 1-year labor warranty on top of that and if there is any problem we will make the proper repairs without any charge to you. There is a reason why many contractors, government agencies, the military, and many other commercial fence clients put their trust in West Florida Fence. If you’re looking for an elite commercial fence contractor call us today for a free quote at 813-251-5883 and we will be more than happy to provide you with a free custom quote for your commercial fence project. Please call or e-mail us today for more information on our commercial fence products and services. We happily serve cities throughout Florida, including Tampa, Brandon, Bradenton, Sarasota, Ocala, Fort Myers, and other surrounding areas.